The Facebook video, posted on Monday by Hasanah Tykeeba, is titled “PHILLY CANT NEVER CHILL.” In it, nobody is chilling and by early Tuesday morning, it had been viewed nearly 150,000 times. What’s shown over the course of a minute of footage is a mass brawl between two families in the middle of a Southwest Philadelphia street. There are flying kicks delivered from atop parked cars, and a pair of police officers attempting to restore order. Then, 30 seconds in, a baton-brandishing female officer is shown entering the fray. The street clears out and she’s one-on-one with a teenage female. That’s when everything turns from Worldstar entry into footage that will leave Philadelphia Police Department spokespeople fielding questions from the media and push-back from the activist community. The officer is shown pushing the teen, who responds by grabbing the officer's arm. The camera turns away from them momentarily, and then the officer is shown tossing the woman to the ground and throwing 10 punches in the direction of her head. It's unclear in the blurry video how many times those punches connected. Police would later announce that the 16-year-old suspect admitted to striking "the officer in the face, knocking her glasses off the officer's face (and) breaking them." That portion of the video has already prompted web posts like “GRAPHIC VIDEO: FEMALE POLICE OFFICER BRUTALLY BEATS YOUNG WOMAN!” Comments on the videos ranged from chastising the police officer to questioning why the girl didn't just walk away when instructed to do so. According to NBC10, the brawl broke out around 3:30 p.m. near 54th Street and Springfield Avenue. Police were summoned to the scene to break it up. A police spokesman reiterated Tuesday morning that the incident remained under investigation, and later responded with updated details (see bottom of this post for that). A witness also noted that the girl, whose mother recently died, was actually trying to break up the melee. It’s also captured the attention of Asa Khalif, of Black Lives Matter Pennsylvania, who held an emergency meeting at 8 a.m. Tuesday to discuss the video. 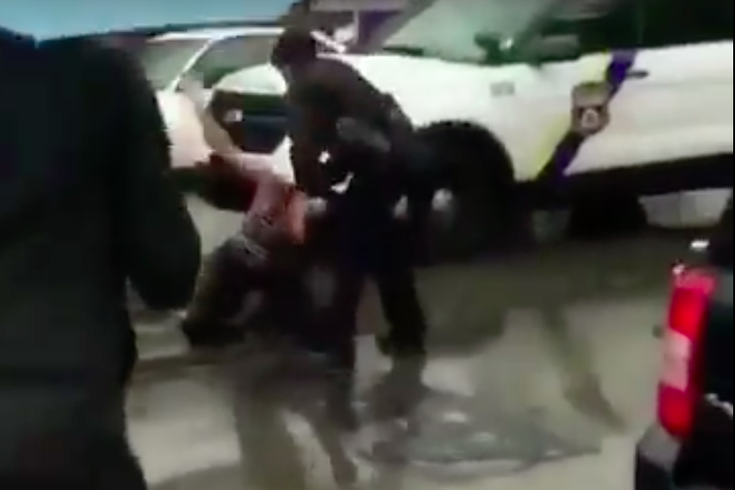 By 8:30 a.m., Khalif was telling PhillyVoice that the group demanded the officer be taken off patrol duties while the department's "flimsy a-- investigation" was conducted. The point of the emergency meeting was to gather information "from the streets" about the officer's reputation because "the streets will tell you the truth." And what did he hear? "The officer has a reputation for specifically getting in black girl's faces in a 'you think you're bad, I'll show you what bad is' way," he claimed. "Maybe she should quit the force and join the WWE or MMA since she thinks she's the black Ronda Rousey. You can see that spirit in her when things started escalating again." Having watched the video "100 times from all different angles," he said the confrontation could have been averted if the officer's had used her training to defuse a situation "that was already under control." Khalif noted that young African Americans "have enough pain" driving them to fight. "This was a missed opportunity," he said, suggesting the officer could've calmed the young woman down instead of throwing her to the ground "by her hair, no less." "I'm not anti-cop, but they make our argument for us when they do s--- like this," he continued. "We're talking about an adult with a child, in a hostile environment where (the adult's) job is to de-escalate. Telling her to calm down, to take a breath, that's the type of video I'd have rather seen." Now, he said, instead of discussing how best to connect with youths, and find out what leads to situations like these, the narrative will focus upon violence. "We will have a swift response today. We're not playing in 2017," Khalif said. "We want her a-- off the streets. She should not be out there with anger issues toward young African American women, and she should not be that out of control when our young people are already hurt and angry from being set aside and disenfranchised. "I'll never blame a child when an adult could have defused the situation. Now, she's the star of the show." On Monday, January 2, 2017 at 2:45 p.m., 12th District responded to a radio broadcast for a “Person with a weapon” at 1300 S. 54th Street. Upon arrival, Officers observed a large group involving teenage juveniles and adults (approximately 30 people) outside fighting. The 16-year-old defendant involved in this incident was interviewed in the presence of her guardian and informed investigators that she attempted to interfere with officers as they were attempting to arrest one of the individual engaged in the fights. At that time a female officer began to give several verbal commands and push her back away from the scene. She continued to argue with the officer as she continued to move her back. The defendant indicated that she slapped the officer’s hands away from her and told the officer to get off of her. Both the defendant and the officer stated that the defendant struck the officer in the face knocking her glasses off of the officer’s face breaking them. At that time the officer began to struggle with the defendant and grabbed her by the hair, taking her to the ground. Both the officer and the defendant indicated that they both threw punches, striking each other while on the ground. Eventually the defendant was brought under control with the assistance of other responding uniformed officers. The officer sustained bruising to her right eye and cheek along with abrasions to the right knee but chose not to go to the hospital at this time. The defendant was transported to CHOP from complaint of pain to her neck. The defendant is being charged with assault on police, disorderly conduct and related charges. Several version of the incident was captured on video by many different individuals out at the scene which provided various vantage points of the incident and placed on many different social media platforms. Defendant: 16 years old, 26XX S Holbrook St., Phila Pa, 19143.